Prophet Muhammad was the first to write down the Quran revealed to him. He also had other scribes helping him in the writing. He had to be a literate man to be sure that any unusual words, like Becca, for example or any unusual use of a letter like a subtle yaa, an alif, a closed Taa or open Taa,….etc. are used in the proper way and place. When Muhammad died, the whole Quran was completely written down, although not in one book, but rather on pieces of woods, papers, palm leaves, animal skin, bones…etc. Muhammad also left clear instructions of the order of writing the suras (chapters) of the Quran, the beginning and end of each verse and sura and the absence for example of Basmallah from the top of sura 9. It was the first Khalifa, Abu Bakr who collected the Quran into one book. The manuscript on which the Qur'an was collected, remained with Abu Bakr and then with Umar (the second Khalifa), and after him, it remained with Hafsa, 'Umar's daughter and one of the Prophet's wives This copy of the Quran, was the only copy made after Muhammad's own copy. It is from that copy that Uthman, the third Khalifa, made other copies to distribute to different regions of the Islamic Empire. Uthman returned Hafsa's copy of the Quran to her. Her copy however was later burned by Marwan b. Hakam (d.65/684). If the copies available to Marwan B. Hakam were the same like Muhammad's own copy that Hafsa's had, it would be no problem. These copies differed and caused M.B. Hakam a lot of political unrest, therefore he ended this turmoil by burning the ONLY copy left for the Muslims by the prophet Muhammad. Burning of Hafsa's copy was the last chapter in covering up the addition of two false verses in sura 9 as was discovered later. All this goes along God's plan who had the Quran protected in Master Tablet and has the system to show the correct Quran ready to use in the right time. Since the mathematical miracle of the Quran was destined for 1400 years later, the reform of the Arabic script was actually allowed over a long period of time to prepare for the appearance of God's miracle of the Quran. The complexity of the miracle would not be understood by these early generations of Muslims. The miracle was destined for the people of the computer era. Muhammad and many generations after him would not grasp the mathematical formulas that needed a computer to present to the world. That was also a reason the text of the early Quran did not have all that was involved in the miracle as the Hamzas, the dagger alifs, the numbering of the verses and suras. The Reform of Arabic Script. The first writings of the Quran were simple Kufic writing but with the increasing number of non-Arab Muslims, there was a greater need for facilitating reading and learning of Arabic. A page from the copy of the Holy Qur'an, from the time of Caliph Uthman, kept in Tashkent (part of Sura 7 verses 86-87). The red line, added by us, mark that part of verse 86 that appears in the image. The red square was added by us to mark the beginning of the verse 87. Since several letters of the Arabic alphabet share the same shapes, and since vowels are not clearly indicated, some reform was needed to avoid confusion, and a system of Naqt or I'jam (letter-pointing), and Tashkeel (vowel indication) was developed. Abul Aswad al Du'ali (d. 688) was the legendary founder of Arabic grammar, and is credited with inventing the system of placing large colored dots to indicate the Tashkeel. It was used with the Kufic scripts, but proved to be somewhat cumbersome to use with smaller scripts, or in ordinary writing. The Ummayad governor Al Hajjaj ibn Yusuf al Thaqafi enforced a uniform system to distinguish letters by using dots, which he asked two of al Du'ali's students to codify. Al Khalil ibn Ahmad al Farahidi (d. 786) devised a Tashkeel system to replace Abul Aswad's. Al-Farahidi introduced vowel signs inspired by the initial shape or parts of certain letters. The sign 'hamza,' for example, is part of the letter 'ayn' (without its end-tail). His system was universally used since the early eleventh century, and included six diacritical marks: Fathah (a), Dammah (u), Kasrah ,Sukun (vowelless), Shaddah (double consonant), and Maddah (vowel prolongation) which is applied to the Alef. Abu Ali Muhammad Ibn Muqlah (d. 940), along with his brother, became accomplished calligraphers in Baghdad in an early age. Abu Ali is credited with developing the first script to obey strict proportional rules. The following images show the same two verses shown earlier in modern Arabic writing. 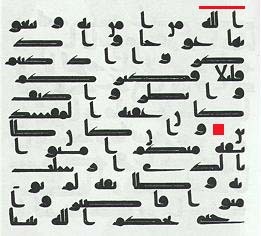 The red line in verse 86 marks the first word in the image of the Kufic writing earlier.. The red line in verse 87 marks the last word in the image of the Kufic writing earlier. Several calligraphers in the much expanded Islamic world have written several copies of the Quran, some of them depended on the readings of the Quran and therefore disagreed with each other in some of the Quran's orthography. The Ottoman empire had the Turkish version of the writing of the Quran spread in many of the countries under its occupation. This made the Turkish edition very wide spread at that time but it did not stop the presence of other versions of Quran writings that differ than the Turkish edition. It was not until the year 1918 when the Muslim scholars, gathered in Cairo, Egypt, and decided to write a standardized edition of the Quran that avoids all the obvious scribes' errors in different editions of the Quran floating in the world and to standardize the numbering f the suras and verses of the Quran. In 1924, they produced the edition of the Quran that later became the standard edition around the world. They depended mainly on the oral transmission of the Quran to correct all the contradiction seen in the different Rasm (Orthography) and numbering of different Qurans. Their choices, and decisions of how to write certain words, and to number the suras and verses, except for few human errors, proved to be God guided and "not on their own" effort although it may seem so to the outsiders. This becomes very clear when you study their choice of the standardized numbering of the suras and verses and the writing of certain Arabic letters like the Alif (Alef), the Taa, the Yaa and the subtle Yaa as we will explain later and as proved by the mathematical miracle of the Quran. In fact, in a complete comparison of the Turkish and the Egyptian editions texts we find some 5300 'short strokes' in the 1924 Egyptian text, in places where the Turkish text has consonantal symbol alifs. Yet, there are about the same number of places again where both texts contain short 'strokes', and they apparently agree on these. Thus the 1924 has over 9,000 such 'strokes' altogether! By comparison, between the Taj (as in the Swahili) text from Karachi and the 1975 Islamic Foundation ('83 Amana) text, itself bearing the Egyptian 'Uthmanic graphic form ', there are only about 1600 such places where the Taj text contains graphic alifs and the Egyptian text contains short 'strokes'. This and all the changes that took place in the 1924 Egyptian edition, were all in God's planning. This happened in Egypt and 11 years before the birth of the Egyptian man, the messenger of the covenant, who was destined to unveil the mathematical miracle of the Quran and 50 years before that discovery. God was preparing the world to receive what HE calls "One of the great miracles" 74:35 . This also has to happen right before the computers take over the world and become a household item. This discovery proved that the changes made in 1924 edition was divinely guided. It also proved the significance of the oral transmission of the Quran in preserving that Holy book. Another edition of the Quran appeared in 1405/1985 in Saudi Arabia, King Fahd edition, 'Mushaf al-Madinah' that was very similar to the Egyptian edition and has also been distributed throughout the world. The messenger of the covenant, Dr. Rashad Khalifa, 50 years after the 1924 standardized edition of the Quran, was blessed by the unveiling of the mathematical miracle of the Quran in 1974. Using the Egyptian edition that was written after "Hafs" he presented to the world the proof that this writing of the Quran was not by a mere co-incidence but was divinely guided, and beyond any human power, even with the few human errors seen in its collection. The proof was strengthened and confirmed by a mathematical structure in the Quran discovered in 1974. That year 1974, which happens to be 1406 Hijri year after the revelation of the Quran (1406 = 19 X 74), was a milestone in proving that the Quran passed down to us in the oral and written form has been preserved and verifiable. This mathematical structure, that is based on number19, and described in sura 74, confirmed the accuracy of the transmitted Quran and the re-writing of the Quran, and will always allow the confirmation of any written Quran. It has already played a major role in exposing the "always suspicious" two verses of sura 9 as false. In conclusion: From the above short history we can see that Quran in all its stages has been part of a bigger plan that will culminate in the unveiling of the mathematical miracle of the Quran. The miracle confirmed that all the stages were totally under control of God Almighty. The mathematical miracle will be with us to the end of time and will be an effective tool in distinguishing a correctly written Quran from one with human errors and will make it possible to have a one standardized edition of the Quran. Arabic Calligraphy, Music to your eyes. The Reform of Arabic Writing.